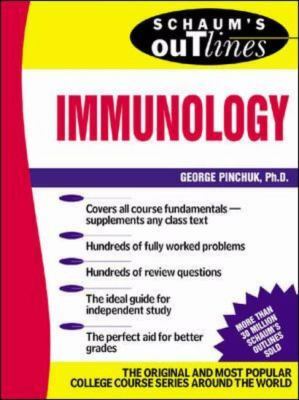 Easy-to-understand review of the basic topics in immunology More than 200 detailed problems solved step-by-step Perfect for the professional reviewing core concepts Covers molecular, cellular, and systemic immunology Use with these courses: Biology Microbiology Molecular Biology Biological Engineering Biochemistry Animal and Dairy Sciences Pre-medical Studies Pre-veterinary Studies SCHAUM'S OUTLINES OVER 30 MILLION SOLD Master the fundamentals of immunology with Schaum's­­the high-performance study guide. It will help you cut study time, hone problem-solving skills, and achieve your personal best on exams and projects! Students love Schaum's Outlines because they produce results. Each year, hundreds of thousands of students improve their test scores and final grades with these indispensable study guides. Get the edge on your classmates. Use Schaum's! If you don't have a lot of time but want to excel in class, this book helps you: Use detailed examples to solve problems Brush up before tests Find answers fast Study quickly and more effectively Get the big picture without poring over lengthy textbooks Schaum's Outlines give you the information your teachers expect you to know in a handy and succinct format­­without overwhelming you with unnecessary jargon. You get a complete overview of the subject. Plus, you get plenty of practice exercises to test your skill. Compatible with any classroom text, Schaum's let you study at your own pace and remind you of all the important facts you need to remember­­fast! And Schaum's are so complete, they're perfect for preparing for graduate or professional exams. Inside, you will find: A concise approach to the basics of immunology Solved problems that supplement any immunology course Outlines of the dynamics of immune responses and their outcomes Unique approach to immunology as it relates to biological sciences, pathology and medicine If you want top grades and a thorough understanding of immunology, this powerful study tool is the best tutor you can have! Chapters include: Overview of Immunity and the Immune System Cells, Tissues, and Organs of the Immune System Antibodies and Antigens Maturation of B Lymphocytes and Expression of Immunoglobulin Genes The Major Histocompatibility Complex Antigen Processing and Presentation T cell antigen recognition and activation B Lymphocyte Activation and Antibody Production Immunologic Tolerance Cytokines Innate Immunity Effector Mechanisms of Cell-Mediated Immunity Effector Mechanisms of Humoral Immunity Immunity to Microbes Transplantation Immunology Immunity to Tumors Autoimmunity and Autoimmune Diseases Immunodeficiencies Be sure to check out Schaum's Outlines for help in your other studies: Biochemistry, 2nd Ed. Biology, 2nd Ed. General, Organic, and Biological Chemistry Genetics, 3rd Ed. Human Anatomy and Physiology, 2nd Ed. Mathematics for Nurses Microbiology Organic Chemistry, 3rd Ed. Physics for Pre-Med, Biology, and Allied Health StudentsPinchuk, George is the author of 'Schaum's Outline of Theory and Problems of Immunology', published 2001 under ISBN 9780071373661 and ISBN 0071373667.